Disney's Aulani Resort and Spa opened in the Ko Olina Resort area of Oahu, Hawaii on August 29, 2011. The location for Aulani, right on the oceanfront in beautiful Ko Olina, about 17 miles north of the Honolulu Airport, is spectacular. Hawaiian culture and tradition come to life in this resort, modeled after the Hawaiian village concept. The ocean views, white sandy beaches, tropical foliage and salt-water lagoons make this resort a great vacation destination. Very similar to a Disney Cruise Line daily navigator, guests of Aulani receive a daily 'IWA (pronounced e-v-a) in their room every morning. These are crucial for planning your day at Aulani and something you should definitely read over in the morning. The daily 'IWA lists all of the events and activities, character greeting locations, and hours of operation for many of the venues. We've scanned a full week of 'IWA's for your reference. Please note that the details listed in the ones below are very likely to change and should only be used as a reference. You can also search for Aulani specific threads! Many of the contemporary custom furnishings pay homage to ancient culture. Fabrics in earth tones were inspired by kappa, or bark cloth, known for its subtle intricacy and embossed patterns. The headboards reflect outrigger canoe shapes and butterfly joints that were used to mend precious wooden bowls. Fabrics from the 1940s and 1950s have been reinvented in the room's pillow and bedding. 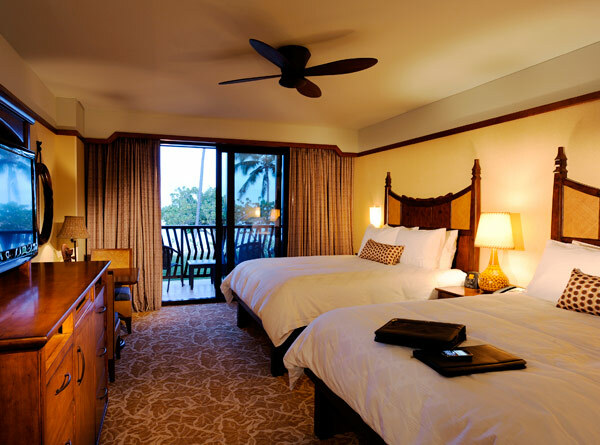 Being a true Disney resort, you will find "hidden Mickey's" in the pineapple-patterned Hawaiian quilts on the bed and Ukulele-playing Mickey Mouse lamp on the desk.